The preliminary rezoning proposal has been drafted for our new middle schools. After a period for community input, the final proposal is expected to be presented to the Board of Education in May. 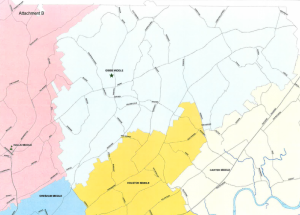 After collecting feedback from parents, teachers and community members, Knox County Schools has developed a preliminary draft zoning proposal that establishes attendance zones for the new Hardin Valley and Gibbs Middle schools. 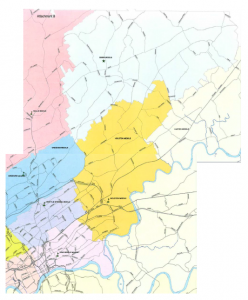 The draft plan also adjusts the attendance zones for Farragut, Karns, Holston, Carter, Vine and South-Doyle Middle schools, while allowing rising eighth grade students and their siblings currently enrolled in middle school to apply to be “grandfathered” at their existing school. Comments received were broad and varied, but generally focused on the following areas: providing alignment with elementary and high school attendance zones to the extent possible; developing zones that would assign students to schools closest to their homes; ensuring there was a level of “grandfathering” of upper grade level students and their siblings to their current middle schools; and limiting the number of students affected by the rezoning proposal to the least number feasible. 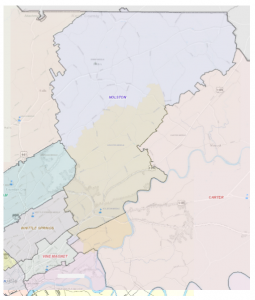 Hardin Valley Middle zone would include all of the existing Hardin Valley Elementary zone and a portion of Ball Camp Elementary zone east of Pellisippi Parkway and north of Lovell Road. It also includes all of the current Farragut Middle zone north and of I-40/I-75, west of Pellissippi Parkway, north of Kingston Pike and east of Lovell Road (Attachment A). 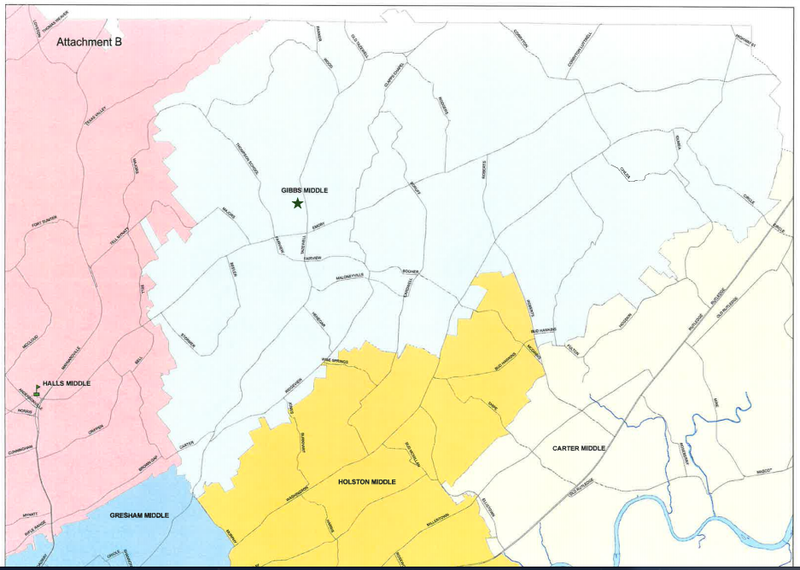 Gibbs Middle zone would require the rezoning of approximately 500 students currently zoned for Holston in the Gibbs and Corryton Elementary School zones (Attachment B). 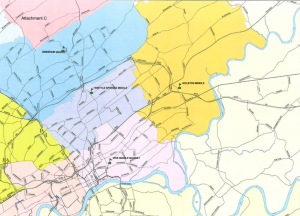 Vine, Carter, Holston and South-Doyle Middle school zones were examined in an effort to provide students an educational experience closer to their homes (Attachment C). Most students who live north of the Tennessee River and are currently zoned to South-Doyle Middle would be rezoned to attend Vine Middle. 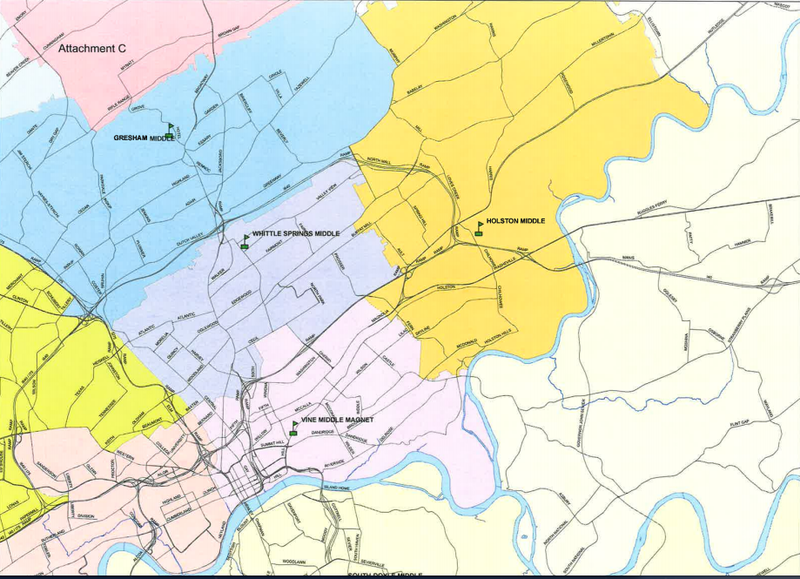 Parts of the current Carter and Holston Middle school zones would also be rezoned to Vine. Students on Boyd’s Bridge Pike from the Holston River to Holston Hills Road, including both sides of Riverview Drive to the intersection of Riverview Road and Brooks Avenue, and students zoned for Carter Middle who reside west of the Holston River and are not part of the rezoning to Vine Middle would be rezoned to Holston Middle. These actions would bring the projected 2018 student enrollment at Vine Middle to about 550 students, South-Doyle Middle to about 850 students, Holston Middle to about 575 students and Carter Middle to 650 students. Karns Middle would have a projected enrollment of about 900 students and Farragut Middle about 1,300 students. Community meetings will be held in the coming weeks to give the public opportunities to provide additional comment. View the preliminary draft zoning proposal below.